FREDERIKSTED, St CROIX, USVI- During Governor Kenneth E. Mapp’s daily press briefings, the governor has consistently spoken confidently about his administration’s response to Hurricanes Maria and Irma, and has lauded the federal response as well. Asked recently by The Consortium how he thought his performance has been so far, Mr. Mapp mentioned a long list of actions that his administration took following the storms, and praised his department and agency heads for helping pull off what the governor has deemed an effective response. Indeed, a recent, unscientific survey by a Consortium reporter who visited distribution centers earlier this week on St. Croix, found that most people were satisfied with the Mapp administration’s handling of the disasters following Irma and Maria. 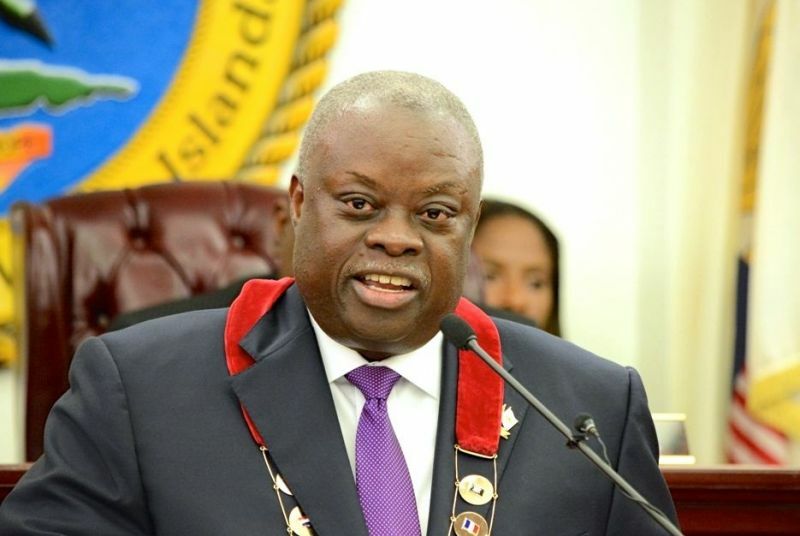 But seldom does Governor Mapp talk about the territory’s financial condition, although the USVI remains dangerously close to financial collapse, according to the top U.S. ratings agencies, with whom the administration has since severed ties. Before the storms, the governor himself said he was running a government from paycheck to paycheck. The government was heavily reliant on tourism-generated dollars to meet a fragile 2018 budget setup, and to keep essential services operational. But Irma and Maria ravaged the tourism industry on all three islands, and brought many operations to a halt. To his credit, Mr. Mapp says the territory’s main economic driver in the months ahead will be in the areas of construction and commerce, as the USVI shifts to rebuilding. But whether the boon will be enough to undergird the budget or, at the least, keep essential services operational is uncertain. So what is the true financial state of the U.S. Virgin Islands? “We’re limping along,” Mr. Mapp told The Consortium during his briefing on Wednesday. Will government meet payroll next week? “I don’t know that I can say to the people tonight that I will meet payroll next week,” he said. Nonetheless, the governor spoke of a bell that rings only when the territory comes dangerously close to running out of money, “and even Maria and Irma didn’t ring that bell,” he said. In a previous press briefing, the governor mentioned potential good news in the territory’s efforts to seek funding in the bond market, which The Consortium learned was related to Mr. Collens’s efforts in New York. But since then the governor has not spoken about it. The Mapp administration severed ties with the top U.S. ratings agencies: Moody’s, Fitch and S&P, frustrated with the firms’ constant downgrades of the territory’s bonds. The move was seen by some as detrimental in the territory’s battle to win the trust of potential investors, most of whom rely in part on the analysis and reports of these major firms. The Consortium attempted to ask Mr. Mapp whether he believed the move was prudent, but the governor asserted himself before the question could be properly posed. Mr. Mapp does not believe that serious investors depend on the rating agencies when making decisions on where to invest their money. “That’s not true,” Mr. Mapp insisted of The Consortium reporter’s response that investors do rely on the ratings firms. “There are people in the market that pay attention to the rating agencies, but a rating agency can’t tell somebody who to lend their money to. And folks will decide what they deem the risk to be, and then there is the issue of what is the cost of that risk,” Mr. Mapp said. But institutional and individual investors have historically relied on bond rating agencies and their in-depth research to make investment decisions. Rating agencies play an integral role in the investment process and can make or break a company’s — in this case the U.S. Virgin Islands’ — success in both the primary and secondary bond market. Will the federal government save the islands from financial ruin? Mr. Mapp told President Donald Trump that the territory needs up to $750 million to rebuild after Hurricanes Irma and Maria, but Mr. Trump cannot by himself approve the funds — the process now involves Congress. And if Puerto Rico were to be used as an example, the commonwealth’s Hurricane Maria-related damage, according to Moody’s Analytics is $95 billion. The White House is crafting a $29 billion disaster aid package that it intends to send to Congress to shore up the federal flood insurance program, and $13 billion in additional relief covering the entire hurricane and wildfire seasons throughout the U.S. and its territories. How much of the $13 billion will Puerto Rico receive? Whatever the amount, it won’t be near the $95 billion it needs to rebuild. The bvi is even worst!